Dragonfly on Lake Huron's Georgian Bay. Dragonfly is 41 feet long and 10 feet wide--roughly the size of a school bus. She draws 3 feet of water, so she can get into some pretty shallow places! Our boat weighed 13 tons when we purchased her (she's made of steel!) Adding batteries and the solar array brings the weight up to 14 tons. 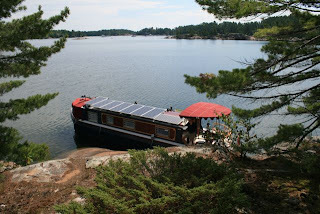 Does the whole boat run on solar power? Yes. The power generated by solar panels is stored in a bank of batteries. These batteries power a pair of electric motors that turn the propeller. We can also use the solar-charged batteries to power other electrical devices (lights, computers, water pump) if we chose--for example, when we are anchored out in a remote place. We also have two back-up charging systems: a diesel generator, and the ability to charge our batteries from "shore power." Dragonfly is very comfortable. She has two staterooms (bedrooms), and a galley/salon (kitchen/living room). The area at the bow has a canvas cover and enough seating for a party! Her top speed is a little more than 6 mph. But we usually run at about 4 - 4.5 mph, because she drains the batteries much faster at higher speeds. Bill picked the name because Cynthia likes dragonflies. (She's the author of a dragonfly-watching guide.) 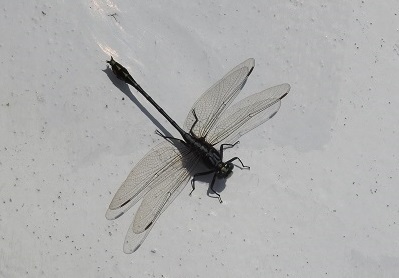 It's appropriate for a boat, because dragonflies rely on the water at all stages of their life cycle. Another point of connection: dragonflies are "solar-powered"—they bask in the sun to warm up their muscles before taking flight. Combined, these factors make “dragonfly” a perfect name for a solar-powered boat. Why did you make the Great Loop trip in 2010-11? The trip was Bill's sabbatical project, a year-long exploration of environmental sustainability, community development, natural history, and engineering. The experience helped him develop new ways of teaching about environmental education to Penn State students who are preparing to be high school science teachers. Read more about the voyage on "Penn State Live"
he also installed it himself. Why did you choose to make this trip in a canal boat? We rented this boat for a 3-day trip in 2010 and just fell in love with her. She was for sale . . . we bought her with the idea that she could be our vacation cottage . . . someone suggested to Bill that she could be used for a sabbatical adventure . . . and the rest is history. Now we're eager to spread the joy of canal boating across America! Let us convince you with Dave Letterman's "Top Ten Reasons to Own a Canal Boat." How long did your Great Loop trip take? We took a year to travel about 6,000 miles. That allowed us to travel safely--if the weather was bad, we stayed in port. Incidentally, we think our trip was the first "sustainably powered" circumnavigation of the "Great Loop," the system of waterways that encircles eastern North America. It's certainly the first Great Loop voyage to be conducted in a solar-powered canal boat! Why did you cruise the historic canals of Canada in summer 2018? Many boaters we met on our 2011 trip recommended we visit Canada's Rideau Canal, a World Heritage site. Looking at the maps, we realized we could do another "loop" and cruise a number of of Canada's historic canals. The trip was also a chance to test a new solar-electric propulsion system for Dragonfly. As with our first trip, we focused on living sustainably and exploring local sustainability initiatives. We Leave Today . . .